The play opens with the actors and dancers performing a song that delivers a well choreographed dance scene, grabbing the audience's attention immediately. Furthermore the use of dry ice enhances a sense of mystery and a chilling presence or foreboding as the devils arrive. The producer had obviously put a lot of thought to designing the detail of the stage as the floor and wall were laid out in black and white to represent a chess board. This helped to create the sense of each character lacking autonomy over themselves or their surroundings, and at the beck and call of the mastermind devils, Sanctimus and Angelo lurking in the background. As Sanctimus and Angelo arrived on stage, they started their conversation straight away about the human lives they have been taking, and what social class they were from,which seem to be a daily routine for them as they talk about it very casually and leisurely which is every interesting as this scene seems to suggest human nowadays committed so many variety of sins and crime to an extent, it has become a normal topic to talk in hell. This of course is aim at the audiences, as cogitation arises from the audiences mind whether the action they committed lately is considered as a ''sin''. The fact that all these human that committed a sins and have their lives taken by the devils, are all from different social class reinforce the idea that no one is save from the grasp of ''devils''. After the devils finished their conversation about the human lives they have been taken, Sanctimus, played by Stacy Coleman suggest to Angelo, played by Peter Wood that they play a ''hell chess game'', using human on earth as pieces in which Angelo pleasurely agree. Human lives here are portray nothing than a mere ''pawns'' at the mercy of undetectable forces that pulled their strings. Moreover this scene reflects on modern human society, the danger of not being able to realise that we are in a game are used by others for their own benefit. Stacy Coleman and Peter Wood both delivered their lines very confidently and even though their role were ''devil'', the conversation they have were very ''humanised'' in a way that people from everyday lives could relate to, including the audiences. The ''devils'' in the play could be interpret in two ways, the one that cunninly and heinously manipulate the human and uses them of their own benefit and fun, which could actually be other human on earth itself, or the ''inner internal'' devils that reside in all of us and its tempting power of lust, desire, greed, pride and anger which could overpower us, if not controlled. It is quite disturbing to observe characters on stage, innocently being control by the devils behind them but it is quite also humorous as audience are drawn in this feeling of uncertainty of what will the devils make the human do or commit Again these intrepretation is left for the audiences to decide but undoubtedly it is a very special scene indeed as it make me to try to penetrate the real meaning of the play. Angelo wasted no time to introduce his ''King'', Giles Newsome a british politician hoping to become a prime minister one day through eliminating his opponent, here played by Andrew Marsden a politician who is currently having an affair with a beautiful but rather un-intelligent pop star called Ruby Ellerman,here played by Daisy Leigh, who is Angelo's ''Queen'' that is currently living in a lofty world of super star hoping that she will become more famous and gained more recognition around the world. Similarly, both of them have great ambition and will go in great length to achieve it. Already we are introduce to the concept of ''lust'' and ''adultery'' as these two character interact with each on the bed, the scene is however not too explicit and is actually done in a comedic way with these two singing together doing their little dance on the bed. Angelo here in this scene had taken advantage of human nature of ''lust'', and believed that nothing could possibly stand in their way toward their goals. As the play goes on more chess pieces start to enter the game, this time Sanctimus make her move and move in her Queen, Harriet Posonby a lawyer played by Gemma Byrne, to break into the room in which Giles Newsom and Ruby Ellerman were having an affair. This of course anger Angelo very much and put Niles into a worrying position as his affair is now known to Harriet and importantly she now have him under her grasp, to be more precise Sanctimus has Angelo's King under pressure. Ruby Ellerman provide a sustainable amount of comedic relief for the audiences as she talk in an idiotic super star style. I believe in this scene, the concept ''lust of power'' is convey through Harriet action of blackmailing Niles, furthermore this scene also bring out the issue of corruption in politics in modern society. With the queen now sent, Sanctimus also sent in the King which is Terry Cross, a chat show host, played by Tony Charnock. I personally have to say, he is one of the best comedic characters in the musical as I find his interpretation of chat show host extremely ridiculously funny. His movement, his accent and his delivered dialogue are so pack and stuffed in humorous nature that I just kept laughing whenever he deliver his lines!, personally for me he did a great job at parodying media nowadays. Tony Charnok had a lot of experience in acting and have been doing it since 2011, an example of his movie is call ''All The Way Home''. In this scene Angelo's queen Ruby was being interview by Terry, which unknown to both of them Angelo commanded Ruby to spill out embarrassing account of Terry at a party. This scene portrays how powerful media can play a major role in society as Terry face became more and more agitated as Ruby continued talking. In a way it show how media become such a powerful force that we human being often felt embarrass and guilty to reveal our inner self. 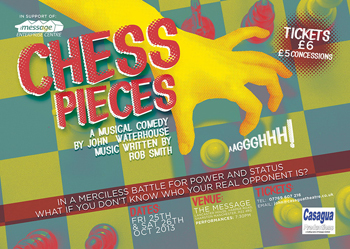 More pieces are constantly reveal as the play goes, this include the Knight, Sir James Tetley, a newspaper proprietor, played by David Hynes and the Bishop, Melvyn Sachs, a Financier, all these chess pieces sent by Angelo to help Niles accomplish his dream of becoming the prime minister in their own way. Again this scene raise a concerning issue how media and economy nowadays are closely link to politics that to an extent that they corrupt each other like a roots that vigorously clench on to the ground tenaciously. Their actions of course are intercept by Sanctimus's Kinght and Rook which are Jade Thompson, a sport women (played by Gemma Byrne) and Antony Crown-Derby, a civil servant (played by Andrew Marsden). Again the variety of different people from different social class used in this game again reinforce the idea of how no one is save from the influence and the manipulated power of the devils. Eventually chess pieces start to get destroy in the end, for example Terry Cross and Jade Thompson are defamed by Sir James Tetley and Melvyn Sachs. Terry Cross defamed by the newspaper as they present his embarrassing pictures from parties mentioned by Ruby and Melvyn defamed for using a special drug to earn medals at the Olympic. I find every scene where Chess pieces are destroy buy others very interesting as for me it seems to reflect on the cruel nature of modern human society in which we constantly unaware what our action leads to or the effect it have on others around us just like how the the human chess pieces destroy each other, not knowing it was all the work of the devils. Surprisingly even at the end the devils lost control of their pieces and pieces, even though on the same team come to a disagreement and split apart from each other like Niles and Ruby at the end. Niles no longer want to be a politician but instead a nurse much to the displeasure of Angelo and Ruby herself. For me this one of the powerful scene that suggests that human being will ever be truly happy if they are free of everything and embrace freedom to the fullest and if ''devils'' are real then indeed ''freedom'' must be God greatest gift. I find it very entertaining when at a certain time dancer on stage will perform their choreograph dance as this break up the sequence of serious and dramatic feeling in the musical and provide a comedic relief for the audiences. It is quite amazing to know that these dancers trained by Megan Elliott were not originally part of the play itself and John Waterhouse have only asked them to be incorporated into his musical a week before the play!. There were some minor flaw throughout the musical but overall they were great and contribute a big part to the success of the play. I personally enjoy the play very much, its cast, its setting and its plot. I felt that every event that was part of the play hide a moral lesson to teach to the audience about modern human society. The fact that there are no huge development in any main characters, I think was done on purpose to represent that if we are all vulnerable to being control or manipulated by someone, none of us deserve anymore attention or sympathies than others. Which then leads to what I think was the important message of the play, which is that we must be more aware of the action we commit and even more aware if we somehow are being control, influence or manipulated to commit those action as it is only ''freedom'', that should control you and influence you, after all is is a God gift.